After writing this post about my productivity things really slowed down with my sewing. My third trimester fatigue and complications (nothing serious) increased and my kids' ability to independently play without me decreased. Then I made the mistake of verbally marveling that we've been so healthy this past winter, so of course, a few of us are now struggling with colds. But it's just life and I am happy to share one of my most "urgent" must-do-before-baby projects is now completed! Cutting out all of the pieces took me almost three evenings. There are over 43 pieces to cut out, all mostly hand cut (a few could be rotary cut). I dove into my stash choosing some bargain Echino I originally bought to make Charlotte a dress, some Lucky Penny fuscia Bike Path originally intended for quilt sashing, and a Summersault raindrop print. This bag has nine pockets! Three of the pockets have zippers. Here's a picture of the lining. Binding seams within the interior was a new technique and I have to say it was NOT easy or enjoyable. Each side took me about two hours! I hope not to revisit that finishing method again and will confess it is not neat looking at all. But I am okay with it because it's all inside the bag anyway. This is my project for this month's Le Challenge, the theme word is "tradition." Making a new diaper bag for myself with each new baby has become a tradition for me. It's a little treat to myself. 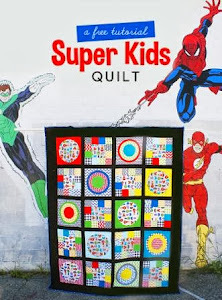 Also linking up with Finish it up Friday at Crazy Mom Quilts. It's finished! My Jacob's Ladder quilt is done. All 2,728 pieces!!! It's easily one of my most favorite quilts I've made. It's from a Blue Elephant Stitches tutorial found here. 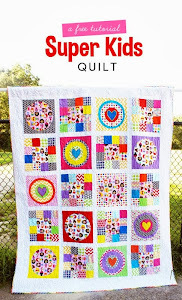 I started it after finishing my Penny Sampler, actually craving a project that would challenge me more (but I still really love that quilt too!) It's been nearly a year since I began this project and it feels so good to wrap it up before the baby and summer comes (no one wants to be hand quilting on a hot day!). I spent many evenings hand quilting it, a process I will admit I did get a little bored of. I used perle cotton, four different variegated colors available from Joann's. I don't think I am particularly good at hand quilting, even after so much practice. I never learned to "rock the needle" and let's just say the back of the quilt is definitely not as pretty as the front. But I am still glad I hand quilted it, I don't know how I would've machine quilted it, and the pattern seemed to call for a very traditional quilting approach. The backing is a pretty choice from Anna Maria Horner's Innocent Crush line. I bought a bunch of it on sale for $5 a yard at a LQS just before I finished this quilt top. I came very close to buying fabric for the binding but finally used some Lizzy House Constellations asteric print from my stash- it was perfect and I actually had a full yard! In the evenings, when my husband and I take a bit of time to indulge our Netflix addiction, I have been doing lots of hand sewing. I took a long break from this routine because I was getting lots of headaches in the evening and couldn't bear to pick up a needle and thread, even if only from the comfort of the couch. Most of that is alleviated now that I finally updated my eyeglass prescription (not wise to put it off for 5+ years). I did some English paper piecing and made some Hexie flowers out of leftovers from making this pillow. These will be a fun addition to my do-your-own sample project that I am anxious to put together. I have also been making tulips for the dyo sampler quilt, using a free pattern found here. I made the leaves quickly with that software I blogged about here. This week, I have also been chipping away at a new diaper bag. It's become a tradition for me to make a new one for each baby- a little treat to myself. I am using Sarah Lawson's Aragon bag pattern and several stash fabrics. There were 43 pieces to cut out- including pieces from 3 different fabrics, interfacing, and the alternative to Soft and Stable- automotive headliner fabric. Bag making almost always requires a cutting marathon. Thanks for reading! I will be back tomorrow with a big finish that I am very proud of!